Family reunions can be some of the best times for many, but for some they are only reminders of the past that they have outgrown and are bitter about. And there are many scenarios in between. 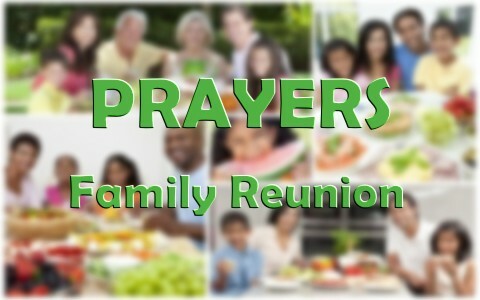 If you have a family reunion coming up, take some time and pray about it no matter how you are feeling about it. Family is important and these reunions are sometimes the only chance we get to visit distant relatives. Here are 5 prayers for different family reunions. Family is important and these reunions are sometimes the only chance we get to visit distant relatives. There are many different points in life we are all at. As your family reunion approaches, give your praises and petitions to God. He is always there. He knows your thoughts and He wants to walk with you in the good times and the bad. May God continue to bless you as you live a life worthy of the calling! Derek Hill is a father of two beautiful children. He plays guitar for the worship team at his church. Listening or playing music is one of Derek's favorite things to do. He has been in the church his whole life. His favorite Bible verse is Romans 8:31 - "What then shall we say to these things? If God is for us, who can be against us?" Derek has written 114 articles on What Christians Want To Know! Read them in the archive below. Next post: How Does The Bible Define The Term Wrath? Will The Sun, Moon, Earth And Sea Be No More In Heaven?